If my kids could craft through the twenty-five days of Christmas, they definitely would! I currently have assorted hand-drawn and stickered Christmas decorations adhered to almost every wall in the house, compliments of my four excited kiddos. The triplets have a tree in their room for the first time this year, and we took advantage of a recent cold weather snap to stay in and craft a few ornaments for their tree. Call me crazy, but I even let them pull out the glitter and glue! 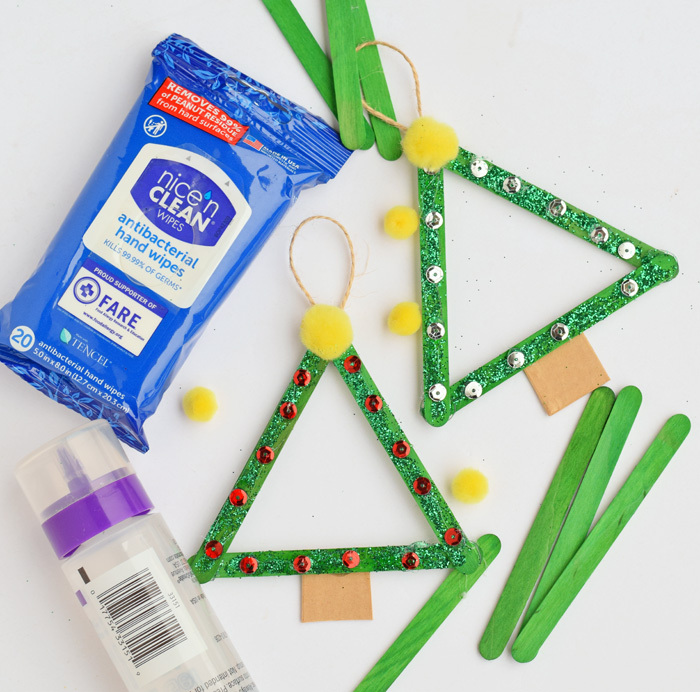 With handy Nice ‘n CLEAN Antibacterial Hand Wipes by my side, we get get rid of 99.99% of germs PLUS remove soil and glitter from hands. Nice ‘n CLEAN wipes are handy to keep close by for more than only crafting! This sanitizing wipe is more effective than using a sanitizing gel. They are a convenient size that works well for for sticking in a hand bag or diaper bag for taking into classrooms, restaurants, and while traveling. 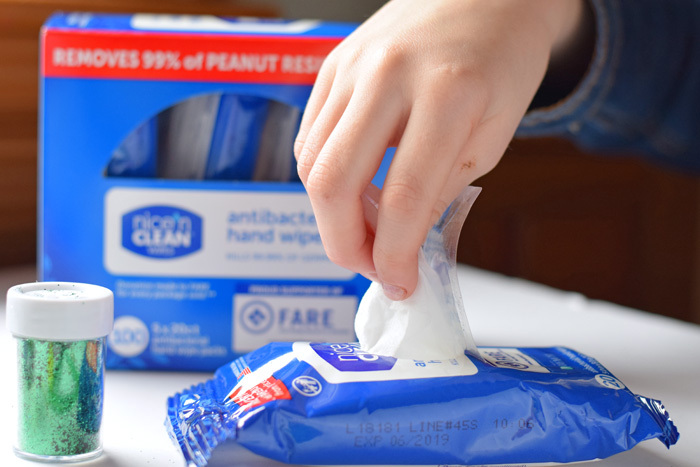 Nice-Pak has been making wipes for more than 61 years, making them a safe choice for removing common infections spread by hands. They make great stocking stuffers or teacher gifts. Head into your local CVS to purchase Nice ‘n CLEAN Antibacterial Hand Wipes 5 X 20ct. Family Value Pack today. 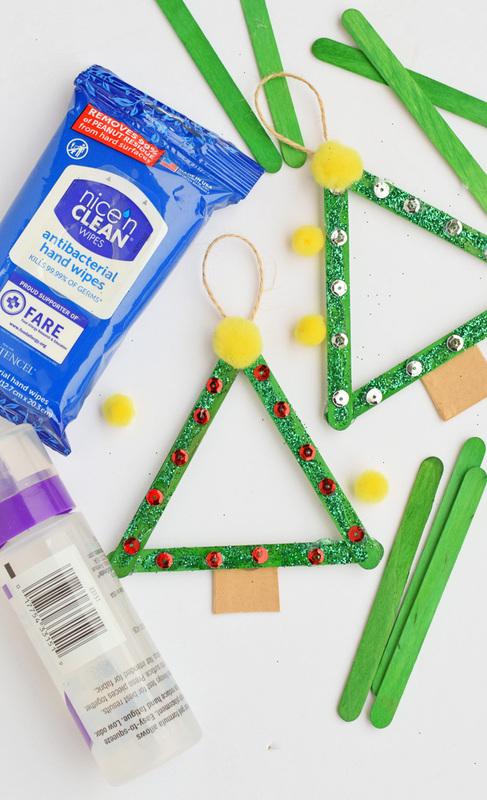 To make this cute Christmas tree craft stick ornament, secure three craft sticks together with the adhesive. Optional: To ensure ornament longevity, I will often adhere the base of the ornament with hot glue and a hot glue gun. This is totally optional, but it will dry faster and allow the child to be able to decorate it sooner. 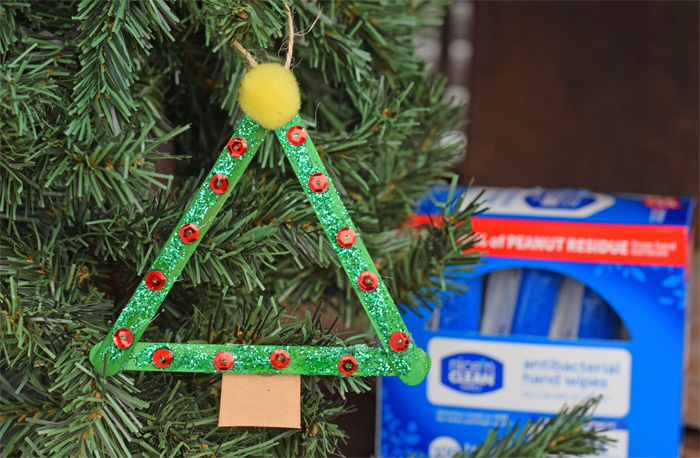 The hot glue gun will also secure the twine ornament hanger better. If the hot glue gun option is used, make sure this step is done by an adult only! 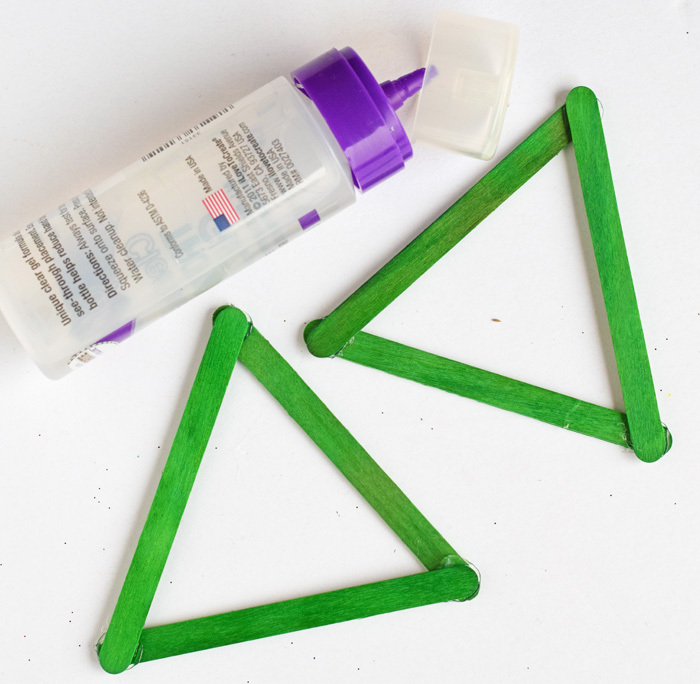 Apply a thin coat of clear adhesive on all three sides of the triangle, smearing to cover the craft sticks. Sprinkle an ample amount of glitter over the adhesive. 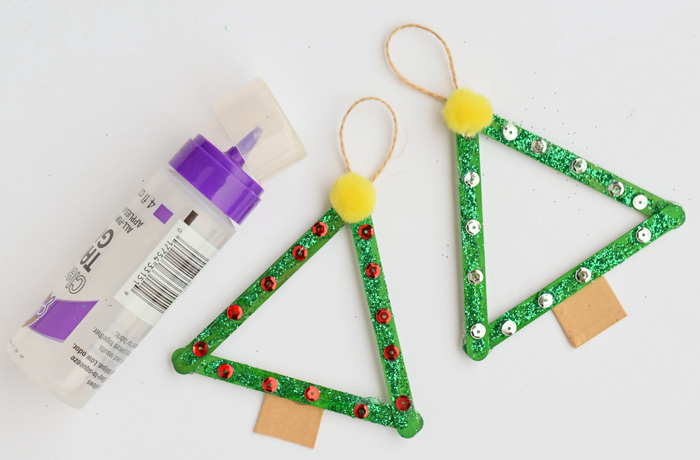 Continue using the clear adhesive to apply the sequins as tree ornaments and the yellow pom as a star. Adhere the brown card stock as a trunk and twine on the back for an ornament hanger. 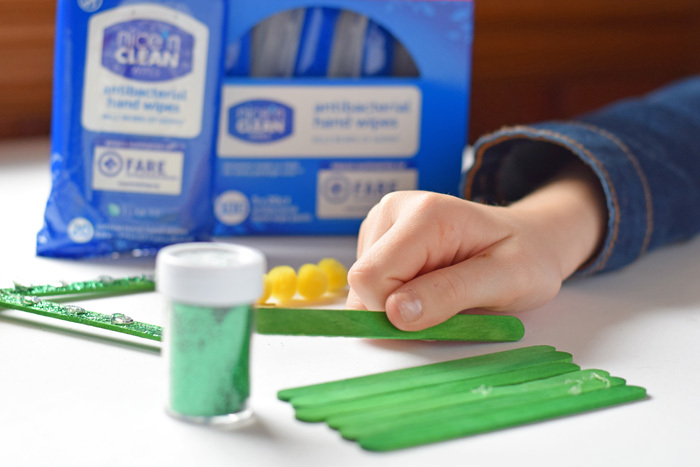 Clean little hands with Nice ‘n CLEAN hand wipes! 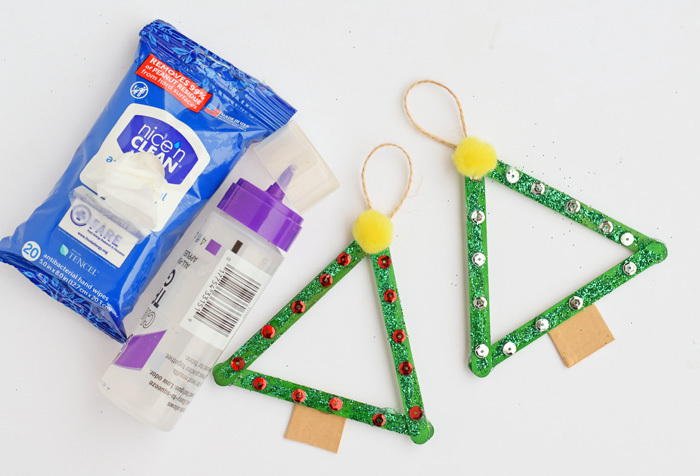 Once all adhesives have dried, the Christmas Tree craft stick ornament is ready to hang on the tree. 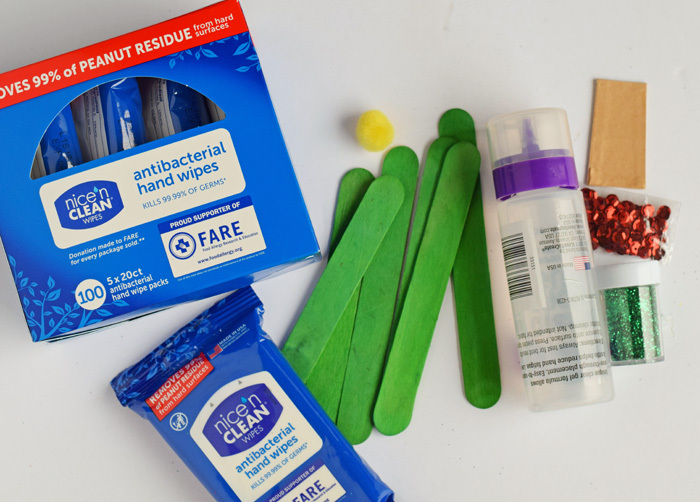 Even though my kids are no longer babies, wet wipes are still a serious mom hack! When used, they can help families keep cold and flu at bay and also protect against food allergies. Clean hands are everyone’s best friend! These are so pretty! My daughter is all about crafts, so she’ll want to make these for sure. I need those wipes as well! I don’t want anyone to get sick. 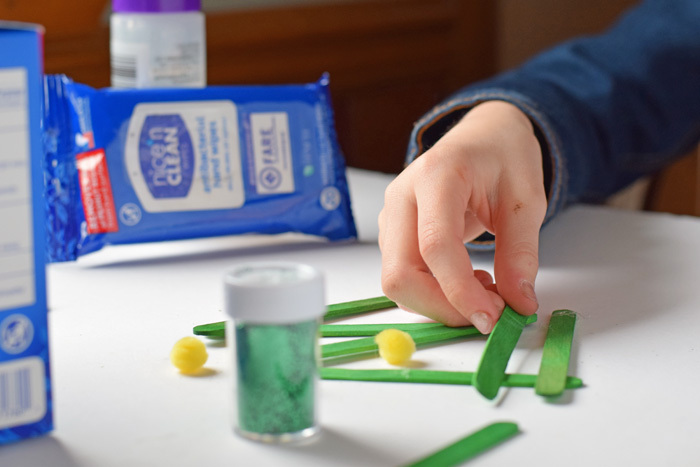 I love having simple crafts to do with the grandkids. These are easy and perfect. Wonderful for the christmas holidays. I will have to try to keep the glitter down as much a possible. Those are very cute and I love how simple they are to make. My kiddos could easily do them without a lot of me helping them. I think we might do eventually so we can decorate the house! SO cute! These turned out so pretty. I love how simple this craft is. Would love to give it a try this weekend. I am not an expert but the homemade original ornaments are always the best. 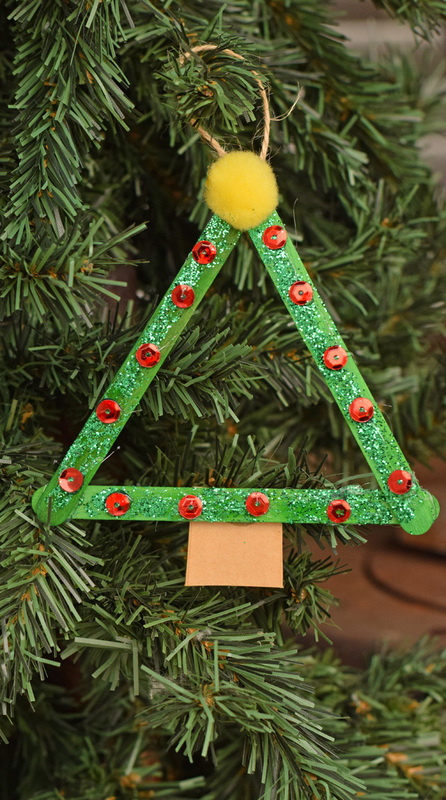 This craft is great to do as a family and looks great on the tree. These came out really cute! The kids love crafting with glitter and would love to make these! That is so cute. I love how easy it is to make. I think I could even do this with the two-year-olds. They love crafts and glitter. This is such a fun craft idea. I’m going to make this with my girls. Nice ornaments. Our family always has wipes in our bags. My eldest daughter carries wipes when she goes to school. My youngest is just 3 years old and and we always want something quick to grab for us to be able to clean her. Having hand wopes handy for crafts is super important. Especially if glue is involved! Those ornaments are super cute! You are a brave brave soul for taking out the glitter! Ha! These are super sweet and will give you joy everytime you hang one on the tree. I am always on the lookout for ahndmade gifts for family members. This is a great craft my daughters can make for their grandparents. This ornament is stinking adorable! Would have never thought to use the wipes to keep fingers clean! Smart! 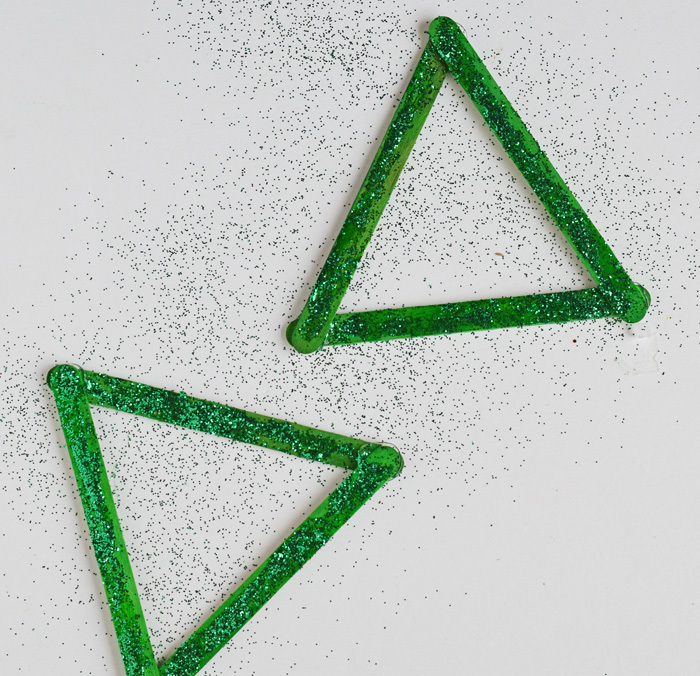 My nieces would love doing this craft – especially because it consists of so much glitter! I need to make this with them. CUTISIMOS!! Was thinking The Grands could do them yearly with their pictures in them. Wouldn’t that be family keepsake worth having?! Gracias for the idea. Well that’s just cute!! Great job, now if only glitter weren’t so dang messy! HA!